Here is an interesting observation from JPMorgan. ETF volumes move with the levels of volatility/uncertainty in the market. 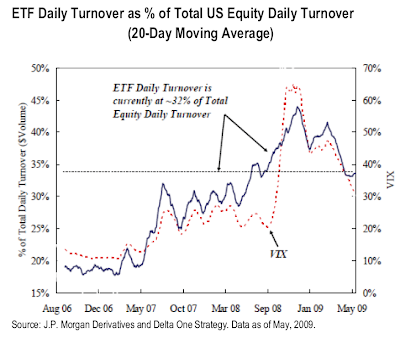 In November 2008 the daily ETF turnover reached 45% as people used SPYs, the Qs, XLFs, etc. to take macro views, to short where they otherwise couln't get a borrow, or to neutralize portfolios without having to puke out all their stocks. Think about it - nearly half the daily turnover in November was from ETFs. SPY is now the most liquid equity security in the world.